The August 2014 edition of Dr. David Williams’ newsletter, ALTERNATIVES, written for the health conscious individual, has a very important essay on the safety of fish. I would like to share some of this with you. Fish is a wonderful source of nutrition, especially protein and essential fatty acids. But we have been told that fish is also very high in mercury and exposure to it automatically results in toxicity and/or disease. This alert may teach us something we never knew before and that is the trace mineral Selenium influences mercury toxicity counteracting the methylmercury found in fish. Our exposure to mercury, which comes from industrial pollution of our lakes, rivers, and oceans, is in the organic form of mercury called methylmercury and which is absorbed through the intestinal tract. Selenium binds tightly to mercury allowing the mercury to exit the body without attaching to any human tissue. The bond is so strong that regardless of the amount of mercury in the fish, if the selenium level us higher, the fish is safe to eat. The best sources of selenium are Brazil nuts and, surprisingly, fish. 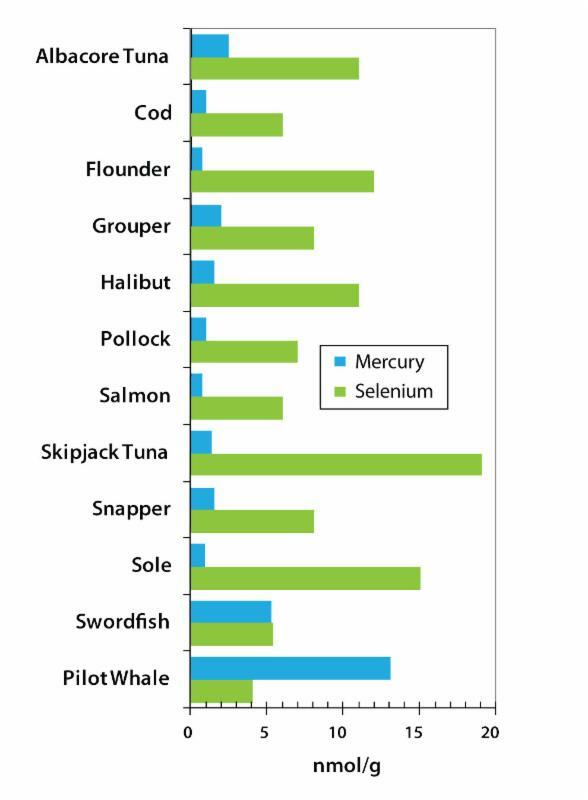 Only a few fish or sea mammals have higher levels of mercury than selenium. The EPA found that 97 percent of the freshwater fish from lakes and rivers in the Western United States are safe to eat. Dr. Williams also points out the importance of selenium to our body’s level of glutathione. Deficiency of selenium can reduce glutathione activity by as much as 93 percent. Glutathione is a major antioxidant and detoxifies environmental pollutants and drugs. Glutathione levels also relate to aging. The higher your glutathione levels, the longer you live. Cruciferous vegetables can raise glutathione levels, but is dependent on selenium. I hope that we have all learned something about this important topic. Despite all the above, I would strongly recommend that we all supplement selenium and not rely on the fish having sufficient levels to over balance the mercury.